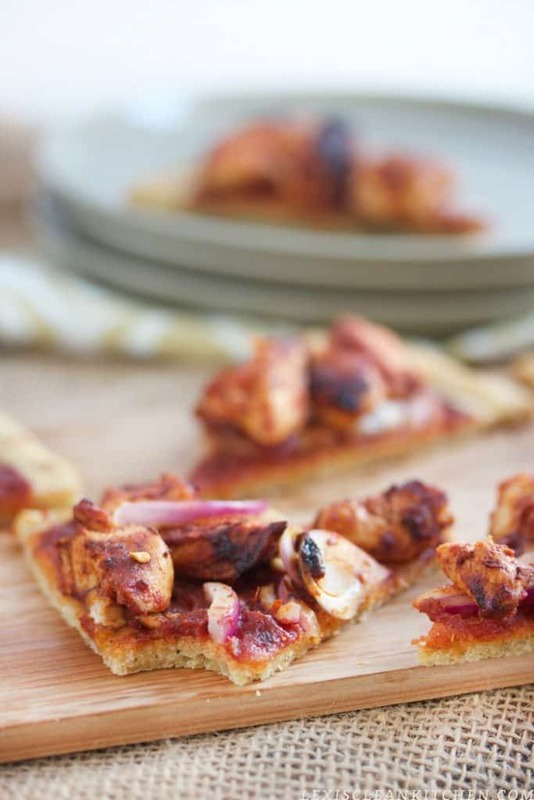 This Paleo Pizza Crust, BBQ Chicken style, is one of our favorites! 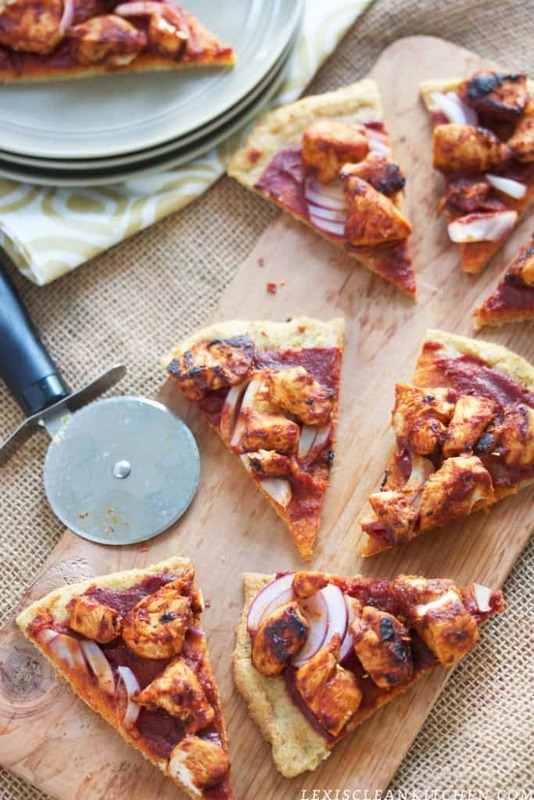 The crust is the perfect all-purpose gluten-free and grain-free crust that everyone will love! The homemade BBQ sauce will be a favorite all season long. Let me be real for a minute here. Back when my brother and I were kids, Domino’s was on speed dial. In fact, I can recite our local Domino’s phone number still to this day (I’m not proud of this). The reason I’m sharing this is so you understand how I feel (felt) about pizza, specifically thin crust. With pepperoni. So good and now obviously so so bad. Many of you have tried my Paleo Pizza Crust made with eggplant, and although I love that recipe, I wanted something more dough-like, more crust-like, and simpler to throw together. After all, we don’t always have 1/2 hour to grate eggplant, and start making the pizza. If you follow me on Instagram, you may have virtually watched me make 5 versions of this to get it right, and now it is soooo right. 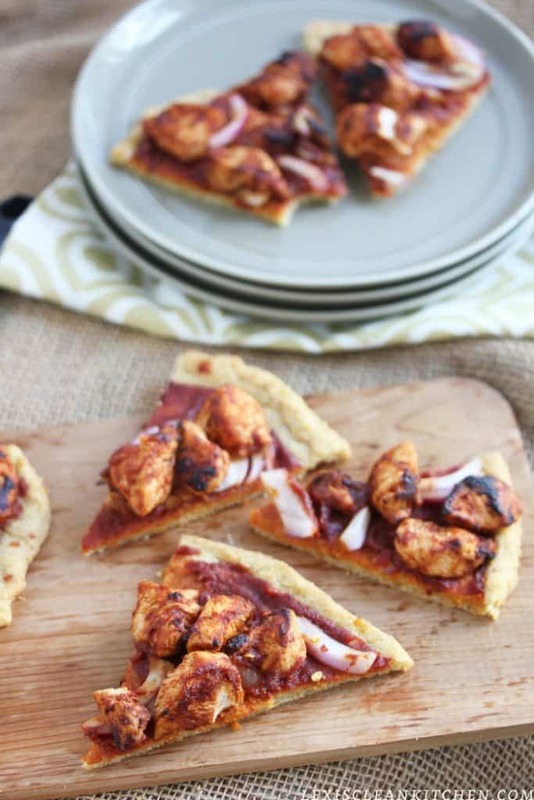 I made this into BBQ Chicken Pizza with my Sweet and Smoky BBQ Sauce, but you can get as crazy as you want with toppings! *If you make it too thin, it'll be hard like flatbread, you want it about 1/3 inch so it rises and is dough-like. Please note that I can't vouch for substitutions that I have not personally made. I have tested this recipe numerous times and have found following this exactly will yield in a great crispy, yet bread-y crust. If you choose to make changes, the recipe may not come out the same. I am beyond excited to try this crust!! 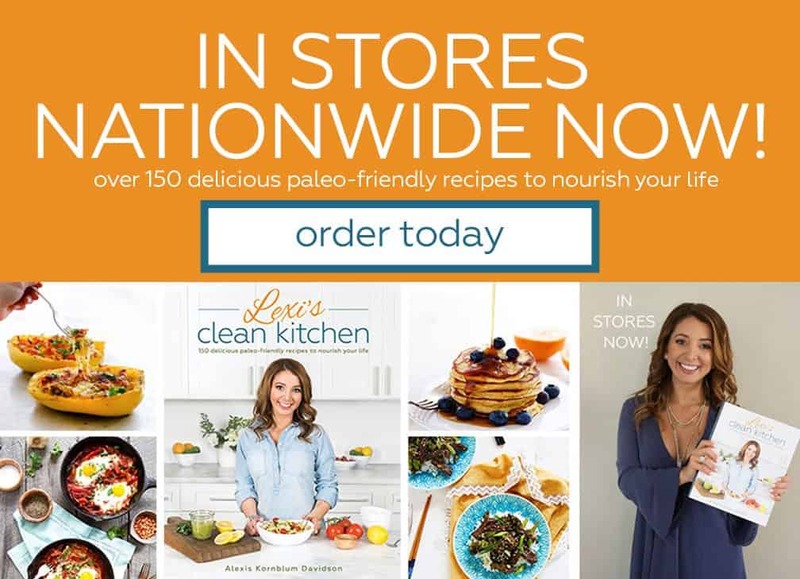 I still haven’t found a paleo pizza crust that I love. I also hate having to rice and squeeze drain the veggie ones so I love that this one uses tapioca even if it does mean that it’s a bit starcher. Looks delicious! Cannot wait to try, would it be possible to sub the shortening for coconut oil? Hi Cassidy! Perhaps butter… I can’t say for sure it would yield the same results, but butter could work, and MAYBE coconut oil! Shortening helps the texture. Let me know if you try a substitution and how it turns out! Do you add toppings before or after you bake the crust? Looks great! I updated that in the directions, you add the toppings after and place back in the oven for a few minutes! Is there anything I can substitute the palm oil for? Perhaps butter! Please note that I can’t vouch for substitutions that I have not personally made. I have tested this recipe and have found following this exactly will yield in a great crispy, yet bread-y crust. If you choose to make changes, the recipe may not come out the same. Let me know if you substitute and how it works out! This sounds like a nice light Paleo crust, better than my almond flour crust. Will be trying this out soon. Hi Lexi! I can’t wait to try this crust. Can I sub arrowroot for the tapioca (that’s what I have on hand)? It’s possible they’ll come out similar but please note that I can’t vouch for substitutions that I have not personally made. I have tested this recipe and have found following this exactly will yield in a great crispy, yet bread-y crust. If you choose to make changes, the recipe may not come out the same! This crust looks so good!! I’ve been playing around with a cauliflower crust recipe and haven’t nailed the texture quite yet–this one looks so spot-on! This post has me seriously craving pizza and I haven’t even had breakfast yet! 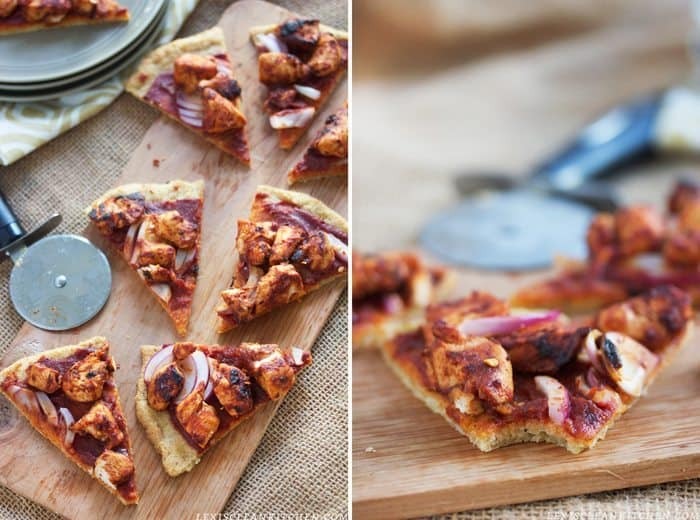 I love the idea of a pizza crust that’s quick to put together and one that you can actually pick up and have a piece of! The bbq sauce-chicken combo looks insanely good too! 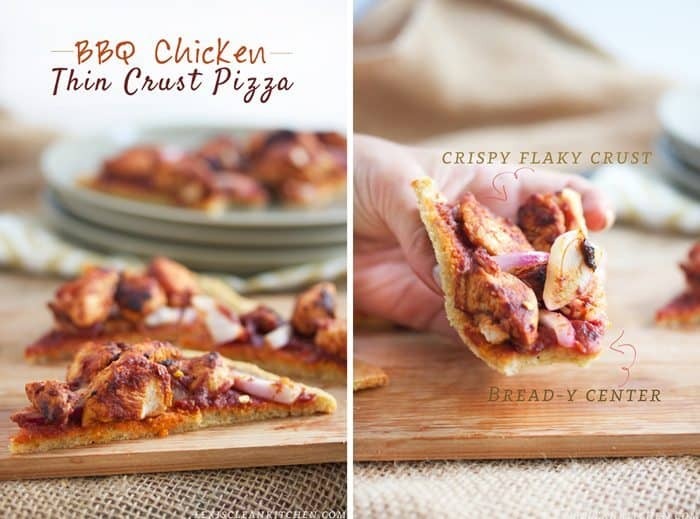 is this crust even real – i loveeeee anything with BBQ so this is definitely a winner. Do you bake it with the parchment on top of the crust or do you peel it off first? dominos is still pretty much on speed dial for me.. but i am definitely inspired to recreate my own pizza like this now. looks delicious! Can you sub oat or rice flour for tapioca flour? And how many servings does this crust make ? Oat or rice flour cannot be subbed for tapioca as it will create a completely different texture! This yields 8 slices. Please note that I can’t vouch for substitutions that I have not personally made. I have tested this recipe and have found following this exactly will yield in a great crispy, yet bread-y crust. If you choose to make changes, the recipe may not come out the same. Looks likes a great recipe! Looved this crust! Recipe is easy and delicious. I used baking soda instead of powder and it turned out perfect! Made a tomato basil pie and a BBQ chicken pie and enjoyed guilt free pizza for the past two days! Can’t wait to try a breakfast pie! 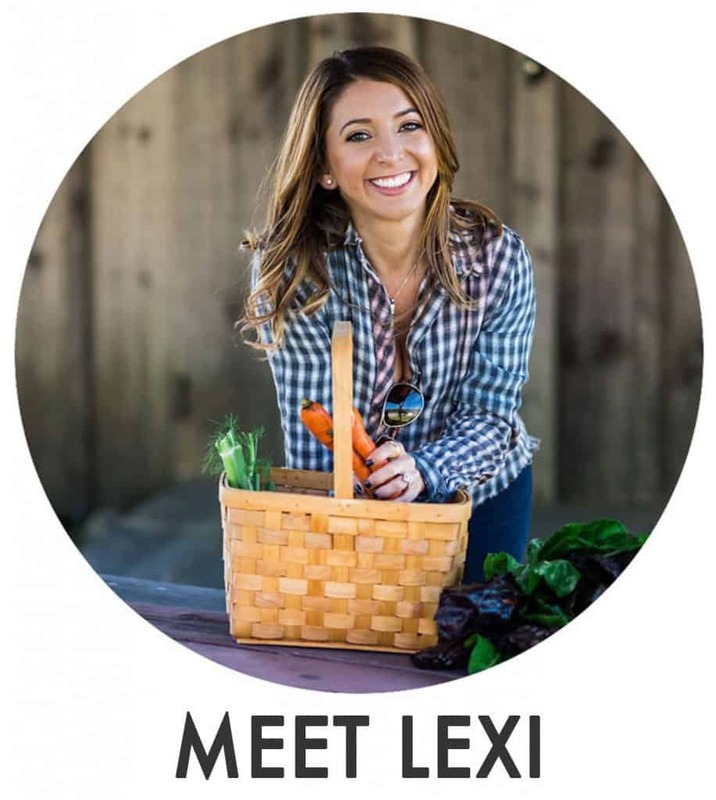 So far every recipe I’ve tried of Lexi’s has been a legit healthy yummy fix. Keep cooking!!!! I was thinking of making a few batches of dough to freeze for quick dinners later. Do you think it would work?! Made this pizza yesterday and it was DELICIOUS! The crust had a great texture, I was very impressed. I loved the seasoning in it as well. SO GOOD! Made it two nights ago, and we are having it again tonight! Great texture, and so quick and easy! Love it! In case others are wondering I subbed coconut oil in for shortening & it turned out great! 🙂 Made it w/ shortening too, texture was the same. Just made this crust tonight for dinner. So good! The toppings were BBQ chicken, delicate squash and peppers. This recipe is a keeper! Lexi…..this was by far THE BEST Paleo pizza crust I’ve made over the past 2 years. Since it’s nut-fee, I may actually get my husband and kids to try it next time I make it. 😀 Based on what I had on hand and what else I was cooking along with this, I had to make a few very minor changes. I wanted to be sure I shared them in case they would be able to help anyone else. 1) I was out of palm shortening, so I substituted in 1/3c of melted coconut oil. 2) I was cooking pizza for my husband and kids at the same time. Their pizza cooks at a much higher temperature than this recipe, so I had to adjust the time for your crust. I cooked mine at 425 for 15 minutes. I also place it in a cast iron skillet. Mine was just the right size for this recipe to cover the bottom of the pan without making the dough too thin. After I baked the crust, I put all of my toppings on and then tossed it back into the oven for another 7 minutes. SO good!!! Ok, so I have never posted a comment before on a blog/recipe. However, after making this pizza crust tonight, I knew I had to. This is by far the BEST pizza crust I have EVER made. My husband, who is NOT paleo, LOVED it. It was truly amazing. It held together well. We actually doubled the recipe and made two of them – and ate two of them. Thank you so much! Great job! Well, this was a hit! I was torn between trying this crust or doing a cheese based crust, but I wanted to enjoy some cheese on top of my pizza and didn’t want to put my digestive system into too much shock. This was just perfect. I didn’t have a rolling pin but I was able to flatten it with my hands through the parchment paper very easily. I also substituted 1/3 c butter for the palm shortening with much success. I could pick up the pizza, even with the generous layer of cheese and 3 meat toppings (i recommend sausage, pepperoni and bacon) and it was more than enough for 2 people! Thanks for this recipe, I am only bummed it took me so long to try it! This is a keeper! What unit of measure for the warm water? It just says 1/3 Warm Water. Is that Cup, Tbsp, etc. ?? So I just made your pizza crust AND your BBQ sauce and for toppings added loads of cilantro, mushrooms, cooked chicken and red onion… and topped with cashew cheese… and it was the best paleo pizza I’ve had to date. Thanks for an awesome recipe! Oh, and the crust was so great – crispy in the right places and passed the hold-test (held together beautifully without bending while holding it from the crust end). 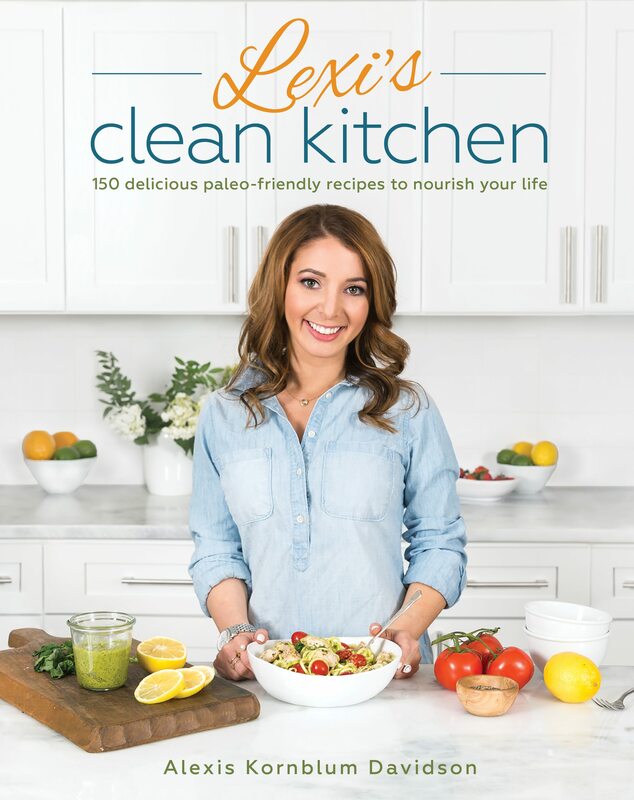 My new go-to recipe! I’m so so happy to hear!!! Glad you loved! What can be used instead of palm shortening? Someone above mentioned that they successfully used coconut oil!